This Special Issue of BMC Medical Genetics presents the papers materials discussed at the biomedical session of the multi-conference “Bioinformatics of Genome Regulation and Structure\Systems Biology” (BGRS\SB-2018) (http://conf.bionet.nsc.ru/bgrssb2018/en/). This international biannual conference takes place in Novosibirsk since 1998 gathering professionals in genomics, genetics, and biomedicine. To accompany this Special Issue, other Special Issues in the fields of genomics, bioinformatics, plant biology, evolutionary biology and systems biology are published as a part of following series: BMC Medical Genomics, BMC Bioinformatics, BMC Systems Biology, BMC Evolutionary Biology and BMC Plant Biology [1, 2, 3, 4], as well as BMC Genomics and BMC Genetics issues. Medical genetics problems have been discussed in the articles from previous post-conference journal issues [5, 6, 7, 8]. In year 2017, respective conference highlights were organized into the Special Issues with reports from Belyaev Readings-2017 memorial event (http://conf.bionet.nsc.ru/belyaev100/en) [9, 10, 11, 12]. 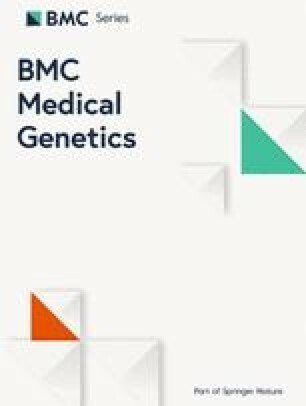 Note medical genetics topics from the conference series were presented earlier at BMC Medical Genomics [1, 12] and BMC Neuroscience  as well as BMC Genetics [8, 11] special issues. The papers comprising this issue of BMC Medical Genetics were discussed at the BGRS\SB–affiliated symposium “Systems Biology and Biomedicine” (SBioMed-2018) (http://conf.bionet.nsc.ru/ishg2018/en/). A brief summary of these papers and related works is outlined below. We start our Special Issue by the paper by Snezhkina and co-authors discussing novel potential causative genes in carotid paragangliomas . Carotid paragangliomas are rare neuroendocrine tumors that arise from the paraganglion at the bifurcation of the carotid artery and are responsible for approximately 65% of all head and neck paragangliomas. Unlike other types of cancer, there is no test that determines benign from malignant tumors. Genetic basis behind the development of these tumors is not fully elucidated, and the molecular mechanisms underlying CPGL pathogenesis remain unclear . Analysis of exome and transcriptome tumor samples allowed Snezhkina et al. to determine novel potential causative genes. Yurchenko et al. presented the exome-wide survey of the Siberian Caucasian population. This study has compared allele frequencies of Siberian Caucasian and European populations from 1000 Genomes Project and identified significant population differentiation as well as a higher proportion of the Finnish genetic component in the Siberian sample. Several of the allelic differences correspond to medically and pharmacogenetically important genes, and these variants will be studied in future on an expanded dataset with associated clinical data. Maria Fedorova and colleagues  used colon adenocarcinoma TCGA RNA-Seq dataset to show that CpG island methylator phenotype, which is common in carcinomatous malignization of serrated adenomas, is associated with the shift in an energy metabolism and sufficient activation of immune-associated pathways. These findings were confirmed by qRT-PCR validation in additional cohort of patients. The ANDSystem tool for association studies in biomedicine was presented earlier at BMC Systems Biology special issues . Diana Osmanova and her colleagues  provide us with insights into involvement of dopaminergic pathways in antipsychotic-induced hyperprolactinemia by uncovering statistically significant association between a certain polymorphic variant of gene MAOB, which encodes dopamine catabolizing enzyme and the development of hyperprolactinemia in response to any antipsychotic drug or their combination, and two other, risperidone/paliperidone–responsive variants in SLC6A3, which encodes dopamine transporter. Problem of depression studies were discussed by the same authors’ group at their recent article at Frontiers in Genetics , also being part of BGRS-2018 special issue. Therapeutical strategies for anxiety-like behavior treatment continued by the works of Fedotova et al. . Here Julia Fedotova discussed vitamin D3 treatment differentially affect anxiety-like behavior in the old ovariectomized female rats treated with low dose of 17β-estradiol . After the menopause or surgical removal of ovaries, females are faced with estrogen deficiency, manifested in mood disturbances, such as anxiety and depression. Hormonal replacement therapy used to treat these symptoms has numerous side effects and not always efficient. Fedotova used rat model to evaluate the effects of repeated vitamin D3 administration on anxiety-related behavior in the middle-aged and old female rats with long-term estrogen deficiency. She determined that repeated systemic treatment with vitamin D3 decreased the symptoms on anxiety-like behavior in the old female rats after long-term ovariectomy. Extension of this work for human patients may provide a safe and efficient alternative therapy for many women. Hence, we present our readers with a wide array of reports describing recent breakthrough in genomics-driven understanding of a molecular pathophysiology of a variety of human disease, covering a spectrum from Mendelian disorders to chronic multifactorial conditions and cancer. At BGRS-2018, the symposium “Systems Biology and Biomedicine” (SBioMed-2018) was also attended by young scientists who gathered in Novosibirsk for a School “Systems Biology and Bioinformatics” (SBB-2018) (http://conf.bionet.nsc.ru/bgrssb2018/en/school/). In previous years, the materials of SBB Schools were published in Special Issues of BMC as well [7, 22]. We invite our readers worldwide to attend our next event - Systems Biology and Bioinformatics Young Scientists School SBB-2019 which will be held in Novosibirsk, Russia 24-28 June 2019 (http://conf.bionet.nsc.ru/sbb2019/en/). Next BGRS\SB-2020 multiconference and biomedical symposium will be organized again in June 2020, in Novosibirsk, Russia. We are grateful to Professors N.A. Kolchanov, V.V. Klimontov and A.V. Kochetov for organization of the multi-conference, “Systems Biology and Biomedicine” symposium and providing platform for international medical genomics research. We thank the Russian Foundation of Basic Research for the conference organization support, Zhejiang Bioinformatics Society (Prof. Ming Chen) for logistic support of conference participants, Novosibirsk State University, Institute of Cytology and Genetics SB RAS (budget project 0324-2019-0040) and RFBR the conference support. The guest editors of the special issue are grateful to the conference committee members and reviewers who helped in the peer-review of the articles as well as in editing and issue preparation: Tatiana Tatarinova (La Verne University, CA, USA), Irina Yushenova (Josephine Bay Paul Center for Comparative Molecular Biology and Evolution, Woods Hole, USA), Oleg Shuvalov and Nikolai Barlev (Institute of Cytology, St.Petersburg, Russia), Petr Slominskiy (Institute of Molecular Genetics, Moscow, Russia), Maria Tikhonova (Institute of Physiology and Basic Medicine, Novosibirsk, Russia), Vladimir Babenko (Institute of Cytology and Genetics SB RAS, Russia), Mariam Muradova and Denis Baranenko (ITMO University, St.Petersburg, Russia), Sergii Tukaiev (National Taras Shevchenko University of Kyiv, Ukraine), Andrei Krivtsov (Dana-Farber Cancer Institute, Boston, USA), Hongyu Yang (Peking University, Shenzhen Hospital, Shenzhen, China), Andre Marakhonov (Medical Genetics Center, Moscow, Russia), Elza Khusnutdinova (Institute of biochemistry and genetics, Ufa, Russia), Ranajit Das (Manipal Academy of Higher Education, Manipal, Karnataka, India). This article did not receive sponsorship for publication. AVB and YLO are guest editors of the special post-conference issues and Program Committee members of BGRS\SB-2018 conference. MYS, ENV, PS are Organizing Committee members of “Systems Biology and Biomedicine” symposium at BGRS\SB-2018. All the authors read, revised and approved the final manuscript. Baranova AV, Klimontov VV, Letyagin AY, Orlov YL. Medical genomics research at BGRS-2018. BMC Medical Genomics. 2019;12(Suppl 2). https://doi.org/10.1186/s12920-019-0480-0. Orlov YL, Hofestädt R, Baranova AV. Systems biology research at BGRS-2018. BMC Systems Biology. 2019;13(Suppl 1). https://doi.org/10.1186/s12918-019-0685-z. Orlov YL, Baranova AV, Kolchanov NA, Moroz LL. Evolutionary biology and biodiversity research at BGRS-2018. BMC Evolutionary Biology. 2019;19(Suppl 1). https://doi.org/10.1186/s12862-019-1368-5. Snezhkina AV, Lukyanova EN, Zaretsky AR, Kalinin DV, Pokrovsky AV, Golovyuk AL, Krasnov GS, Fedorova MS, Pudova EA, Kharitonov SL, Melnikova NV, Alekseev BY, Kiseleva MV, Kaprin AD, Dmitriev AA, Kudryavtseva AV. Novel potential causative genes in carotid paragangliomas. BMC Medical Genetics. 2019;20(Suppl 1). https://doi.org/10.1186/s12881-019-0770-6. Yurchenko AA, Yudin NS, Voevoda MI. Exome-wide survey of the Siberian Caucasian population. BMC Medical Genetics. 2019;20(Suppl 1). https://doi.org/10.1186/s12881-019-0772-4. Fedorova MS, Krasnov GS, Lukyanova EN, Zaretsky AR, Dmitriev AA, Melnikova NV, Moskalev AA, Kharitonov SL, Pudova EA, Guvatova ZG, Kobelyatskaya AA, Ishina IA, Slavnova EN, Lipatova AV, Chernichenko MA, Sidorov DV, Popov AY, Kiseleva MV, Kaprin AD, Snezhkina AV, Kudryavtseva AV. The CIMP-high phenotype is associated with energy metabolism alterations in colon adenocarcinoma. BMC Medical genetics. 2019;20(Suppl 1). https://doi.org/10.1186/s12881-019-0771-5. Osmanova DZ, Freidin MB, Fedorenko OY, Pozhidaev IV, Boiko AS, Vyalova NM, Tiguntsev VV, Kornetova EG, Loonen A, Semke AV, Wilffert B, Bokhan NS, Ivanova SA. A pharmacogenetic study of patients with schizophrenia from West Siberia gets insight into dopaminergic mechanisms of antipsychotic-induced hyperprolactinemia. BMC Medical genetics. 2019;20(Suppl 1). https://doi.org/10.1186/s12881-019-0773-3. Fedotova J. Vitamin D3 treatment differentially affect anxiety-like behavior in the old ovariectomized female rats and old ovariectomized female treated with low dose of 17β-estradiol. BMC Medical Genetics. 2019;20(Suppl 1). https://doi.org/10.1186/s12881-019-0774-2.